It is the best major studio horror movie in years. 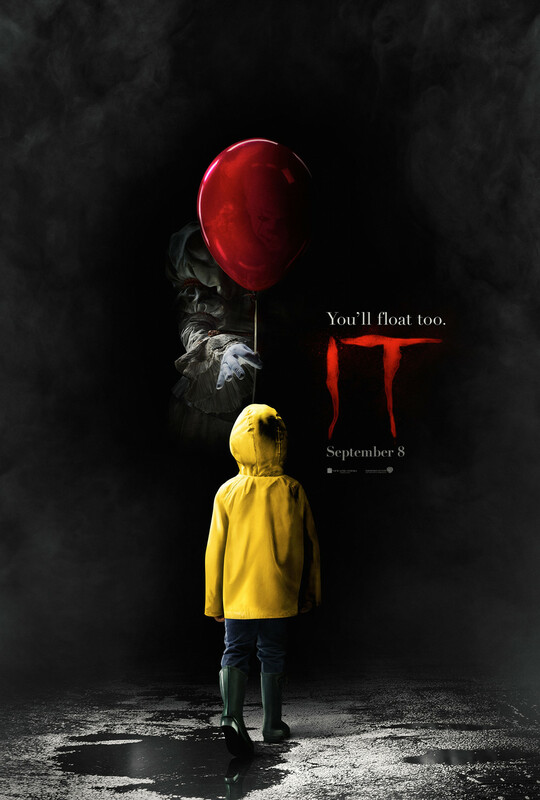 Based on the childhood half of Stephen King's best-selling novel, the film is certainly scary, but also funny, exciting, and even a little heartwarming. Anyone familiar with the story knows it has one heck of a good villain, but what really makes everything click is the emphasis on creating equally good heroes. For every second, you care about the fate of the characters, which ensures a cinematic roller coaster ride that leaves you exhilarated. The story is set in 1988, in a small town where children have been disappearing under mysterious circumstances. Jaeden Lieberher (St. Vincent) plays Bill, a kid whose little brother is one of the vanished. He hangs with a bunch of other bullying victims known as “the Losers.” There's overweight new kid in school Ben (Jeremy Ray Taylor); sarcastic nerd Richie (Stranger Things' Finn Wolfhard); home-schooled student Mike (Chosen Jacobs); sickly Eddie (Jack Dylan Grazer); and anxious Stanley (Wyatt Oleff). Finally, there is Beverly (Sophia Lillis, proving herself to be one of the true “finds” of recent times), a girl with a false reputation for promiscuity. All of the kids begin having terrifying hallucinations involving a sewer-dwelling clown named Pennywise (Bill Skarsgard). They come to believe that he's the one responsible for snatching up the local children. Since none of the adults in town seem too concerned with solving the mystery, the Losers take it upon themselves to investigate. Pennywise is intent on trying to sink his teeth into them, though. Some of the movie's horror comes from the kids' full awareness that, if the clown cannot be stopped, any one of them could be the next to disappear. Director Andy Muschietti (Mama) makes a very crucial decision in his visualization of It. The way the movie is filmed and the way the young characters humorously interact intentionally replicates the look and feel of '80s Steven Spielberg directed/produced movies like E.T. and, especially, The Goonies. In so doing, It taps into our memories not only of those films, but also of the childhood memories they so vividly invoke: the magic of summer vacation, the freedom of riding a bike down the street, getting into mischief with friends, and so on. Pennywise periodically interrupts this nostalgic vibe, and it's almost as though he's intruding upon our own recollections of youth. The effect is phenomenally powerful, particularly if you grew up in that time period, identifying with that distinct Spielberg-ian atmosphere. Pennywise is used sparingly – a good choice, since it ensures his every appearance packs a powerful punch. Skarsgard (Atomic Blonde) is magnificently creepy in the role. His posture, movements, facial expressions, and tone of voice are all off-kilter and menacing. Skarsgard doesn't overplay the villain. He knows that the eerieness of clowns is the idea that makeup and costumes are used to mask one's true identity. The actor plays on that notion, delivering a turn that induces shivers. Muschietti employs some first-rate jump scares with his star. The cast members playing the kids are just as good. All the characters are well-defined, giving them much with which to work. Bill and the Losers go through a range of emotions in the story. The weight of those emotions is palpable, thanks to the skill of the young actors. Bonds of friendship between them seem authentic, as do the feelings of peril. There's not a weak link in this stable of players. It has an obvious surface-level horror involving Pennywise. Underneath runs a second, even more frightening level. This is, at heart, a tale about childhood trauma. Each of the kids has some form of it in their life. Bill, for example, is grieving over his missing brother, while Beverly has a father who's sexually molesting her. Pennywise is, in many ways, a metaphor for the tragic things some children endure. The movie doesn't shy away from exploring the impact of that. Vanquishing the clown means the gang must find a means of coping with their individual traumas. There's a surprising amount of depth in It, but this is also just a great scare show with engaging characters and some hilarious humor to release the tension. Horror is always best when mixing intelligence with boldness. On that count, the picture delivers. Fewer than half of the movies adapted from Stephen King books have been good, and only a couple have been exemplary. The author should drop to his knees and give thanks for one that hits the bullseye like It does. It will be released on 4K Ultra HD Blu-ray combo pack, Blu-ray combo pack, and DVD on January 9. A complimentary copy of the Blu-ray was provided by Warner Bros. Home Entertainment for the purposes of this review. The supplementary features run about an hour and transcend mere promotional material. In fact, they add considerably to one's appreciation of the film. “Pennywise Lives” is an extensive look at Bill Skarsgard's performance. The actor discusses how he developed the evil clown's physicality. That includes using his own ability to practically achieve a “lazy eye” effect, as well as the strategic use of drool. Watching this segment provides insight into how Skarsgard created one of the most memorable screen villains of recent years. “The Losers Club” focuses on the young actors. They describe the ways they bonded on set, while director Andy Muschietti explains how vital it was to have the characters' friendship feel real. It's also interesting to learn that the kids weren't allowed to see Pennywise until the filming of one particular scene, during which their genuine reactions were captured. “Author of Fear” gives us Stephen King talking about the various inspirations for the story, in addition to the way he infused it with actual legends from his hometown of Bangor, Maine. As always, King is wonderfully descriptive and engaging, making this a great look at how his tale was born. Finally, there are 15 minutes of deleted scenes, most of which are just snippets excised from what's in the finished movie. There are, however, two notable exceptions. One is a very funny “gag” version of the opening sequence. In it, little Georgie snatches his paper boat back, leaving Pennywise befuddled. The other is an ending coda that finds Bill and his parents heading out for a vacation. As their car drives down the street, the camera pans over to a storm drain, just like the one from the beginning, and a few drops of rain start to fall. It's a more conventional finale that doesn't quite have the power of the ending ultimately used, which leaves the viewer on a note of connection between Bill and Beverly. A great horror movie, terrific bonus materials, and top-grade picture and sound quality – you couldn't ask for much more from a Blu-ray package. It is rated R for violence/horror, bloody images, and for language. The running time is 2 hours and 15 minutes.